Grant, almighty God, that we may celebrate with heartfelt devotion these days of joy, which we keep in honor of the risen Lord, and that what we relieve in remembrance we may always hold to in what we do. Through our Lord Jesus Christ, your Son, who lives and reigns with you in the unity of the Holy Spirit, one God, for ever and ever. Jesus said to his disciples: "If you love me you will keep my commandments. I shall ask the Father, and He will give you another Advocate to be with you forever, that Spirit of truth whom the world can never receive since it neither sees nor knows Him, but you know Him, because He is with you, He is in you. I will not leave you orphans; I will come back to you." The Optional Memorial of St. Christopher Magallanes, priest and martyr, and his companions, martyrs; Optional Memorial of St. Eugene de Mazenod, bishop (Canada), which are ordinarily celebrated today, are superseded by the Sunday liturgy. The Gospel is from St. John 14:15-21. In this discourse at the Last Supper, which was His last will and testament, our divine Lord promised His Church, through the Apostles, that the Holy Spirit would be with it until the end of time. The Spirit of truth will be directing it and effectively aiding it to preserve the faith, the doctrine, and the morals which Christ taught His Apostles. Looking back now over almost 2,000 years of the Church's history we can see how this promise has been fulfilled. There were heretics and schismatics who threatened the very continuance of the Church as God's faithful people on earth. There were crises and near catastrophes caused by the human weaknesses of its heads and its members, yet the Church survived and spread and continued to send saints to heaven because of the direct and active aid of the Holy Spirit. During those two thousand years great empires have risen and fallen. They had large armies and vast wealth and earthly resources at their disposal, yet they disintegrated like all things human. The names of one-time mighty men who ruled over millions are now nothing more than a nuisance for children in their history classes. The large tracts of our globe which they ruled are now divided and known by other names. This was, is, and will be the lot of all merely human enterprises. Today's despots, where they rule with iron hand, will share the same fate. In the midst of all these upheavals the Church of Christ has continued to flourish because it was directed and sustained by the Holy Spirit, who abides within it. How can we ever show enough gratitude to the three Divine Persons of the Blessed Trinity who planned so lovingly and so efficaciously for our safe journey to heaven? The Father sent His Son as man among us so that we men could become His brothers, and adopted sons of the Father. The Son suffered hardships, insults and misunderstandings during His temporary stay on earth, and ended like a crucified malefactor because of the sins of mankind. But He rose triumphantly from the dead and set up the Church as a society which would bring to men of all races, ages and colors the salvation and exaltation of mankind, which His life and death had won for us. Knowing only too well the weaknesses and waywardness of human nature, He and the Father sent the Holy Spirit to remain with His Church as its infallible guide until the last man has entered heaven. This is a very brief summary of what the Blessed Trinity has done, and is continuing to do for us, through the Church. We, the people of God, the chosen race of the New Testament are God's Church on earth. It is for you and me that the Holy Spirit is at work this very day. When He guides the steps of Peter's successor, the Pope, or the deliberations of the bishops, the heirs of the apostolic college, it is for us and for our salvation that He is acting. 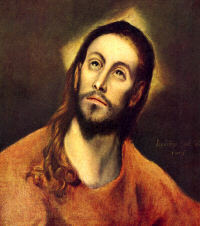 While we are faithful members of the Church, and of Christ's mystical body, while we remain live branches safely attached to the vine who is Christ, we have nothing to fear; we are on the sure road to heaven, to enjoy eternal happiness with the Father, Son and Holy Spirit whom we shall thank and glorify forever. "If you ask the Father anything in My Name, He will give it to you. . .Ask, and you shall receive, that your joy may be full" (Gospel). Petition Sunday, followed by Rogation Days! We petition the Father's blessing upon springtime planting in the fields; yes, and in our souls. We ask in the "Name" of Jesus. He intercedes for us with the Father. We must ask only for what keeps us on the Christian road. "I go to the Father," is the signpost on this road to which Jesus points. The Epistle warns us of a dangerous detour, if we ignore this road guide. Religion is vain unless one be a "doer" and not a "hearer" only. "Religion pure and undefiled" in our interior life, means keeping "oneself unspotted;" in our social life, it means the spiritual and corporal works of mercy to all "in their tribulation."